As marketers, we’re always looking to find out more about our audience. What do they like? What do they hate? What are their interests? Why do they buy from us? We’re also not naive and know that different people choose our products or services for a variety of reasons. These people can be grouped into different audiences, or buyer personas. As HubSpot puts it, a buyer persona is “a semi-fictional representation of your ideal customer based on market research and real data about your existing customers.” In reality, buyer personas are just a way to better understand what drives the decisions of your audience so that you can better market to those people. Creating buyer personas is another blog post for another day. But once you’ve already determined these personas through research, you have to put them to use. And the problem for a lot of marketers becomes how to determine which prospects fit into which buyer personas so that you can nurture them appropriately. Progressive profiling is the process of gradually learning more about your audience through their website interactions and information they willingly give you, such as through form submissions. Progressive profiling is a capability found within your marketing automation tool, and can be utilized to move your prospects down the marketing funnel while giving your sales team the information they need to better sell to the prospect. To better understand what we’re talking about, let’s look at a really simple example. Pretend you sell cameras and have three different content offers that are focused toward different stages of the buyer’s journey. The first content offer is a how-to-guide covering portrait photography (your top-of-the-funnel offer). The second is an ebook about the different types of cameras (your middle-of-the-funnel offer). Finally, the last content offer is a downloadable brochure of a specific type of camera (your bottom-of-the-funnel offer). In the past, marketers would be limited with the questions they could ask on each form for each offer. In other words, form fields were fairly static and inflexible. Today, progressive profiling allows forms to be dynamic and change depending on whether or not the prospect has previously given you information. For example, on the “how-to portrait photography guide” you could ask for the basics—first name, last name, email address, etc. On the ebook about different camera types, you could design it so that those who had already filled out the first form are asked new questions, such as “what type of camera do you currently own?” or “job title.” The point is, you’re gaining more information about prospects while keeping conversions high, since you’ve already gathered basic information in the first form. So now we know what progressive profiling is. Now how does it relate to buyer personas? Let’s say you’re a B2B SaaS company. Your platform can solve problems for big and small companies alike, so you have different buyer personas for each to market to their unique needs. Your job, then, is to determine which users are from big companies or small companies, as each will need to be nurtured differently. 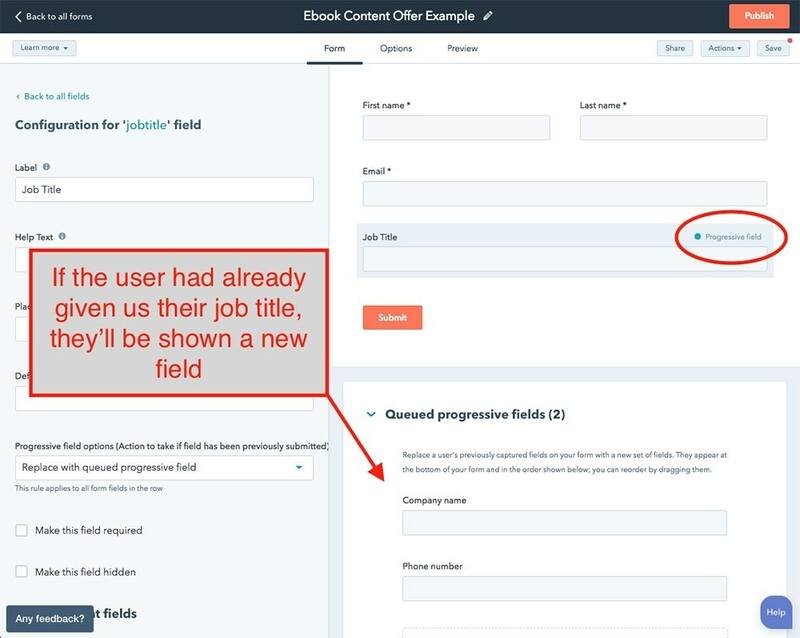 Through progressive profiling, you can ask for company size on a content offer to then segment users into buyer personas and shoot them content focused on solving their unique pain points. Progressive profiling is pretty simple, but there are a few things you need to have in place in order to be successful. After all, it’s kind of like dating—just like you can’t ask what a person’s deepest darkest secret is on the first date, you can’t ask for more personal information like phone numbers on the first form. The first step to effectively gather information from your audience is to have multiple conversion points. Meaning, you can’t have a single content offer or Contact Us form because that limits you in terms of the amount of questions you could possibly ask (without putting 20 different fields on a single form). Instead, make sure that you have content offers and conversion points that span across the buyer’s journey, from the Awareness Stage all the way to the Decision Stage. That way, you have the opportunity to ask the softer questions for users that are early in the buying process without bombarding them with the hard-hitting questions that are reserved for those in the later part of the funnel. Relating to the above tip, once you have a variety of conversion points, you need to figure out what type of information is reasonable to ask for at each stage so that you can build trust with the user. Going back to the B2B SaaS company example, let’s pretend that knowing their budget is really important to your sales team. Obviously, asking about money right off the bat might lower your conversion rate on a content offer, or even render an inaccurate response, as contacts are less likely to be transparent so early in the buying process. So instead of including a budget field on your top-of-the-funnel content offer, maybe you ask for company size, and then provide helpful content to them through email nurturing. You build trust, you track their engagement, and eventually they’ll be more willing to give you that number on the second or third content offer they download. The last tip I have for you is to use smart fields (or dynamic fields) to simultaneously gain new information and improve conversion rates. Essentially, smart fields make certain that you’re not asking the same questions twice*. So if a user has already provided their company size, the field would populate with another question. Essentially, you’d make certain that your forms limit the amount of questions they’re asking for, while always gathering new information from users. *Note that you might want to ask for some information twice, such as email and first name. This is less for you and more for the user to understand how they’ll get the information. After you’ve gathered the information about the users and assigned them to a buyer persona, now it’s time to use it to your advantage. Marketing and sales need to be aligned to reap the best results possible. And with the data attached to the contact in your CRM, sales teams can then have a better understanding of the person and can better speak to the problem they’re trying to solve. Additionally, the information can be used to send your prospect to the appropriate salesperson that’s more likely to be able to speak to their pain points. Another way you can make the most of the information you gather is to use it to personalize the user’s experience. Website personalization allows you to alter your messaging and content to fit the individual person, which can increase conversion rates, brand loyalty, and overall satisfaction. Use the information they willingly give you to market to their interests, pain points, and motivators. Once you’ve determined the users’ buyer personas, then you can feed them relevant content through lead nurturing. Going back to the camera shop example, if you know that a contact is an amateur photographer, you’d likely send them different content than a professional who takes pictures for a living. Once you uncover which persona they fit into, you can then use your email automation tool to guide them to a relevant workflow. Lead scoring and qualification is a powerful tool within any marketing automation platform. If a contact answers a question that qualifies them as a viable prospect in a particular persona type, they should be scored accordingly. If they miss the mark and don’t qualify, then they should earn a negative score. You can then set up triggers based on the contacts’ scores that ensure they’re getting the right information at the right time—whether that’s through a new email offer or a person from your sales team reaching out directly. Last but not least, you can use the data gained through progressive profiling to then look at the conversion paths different buyer personas actually took compared to the paths you thought they’d take. Maybe a downloadable content offer was created for one persona group, but you actually find that a different persona has a higher conversion rate and that those who download the resource are 2x more likely to purchase your product. Knowing this might affect how you launch future products or services, and how you might tweak or adjust your messaging and marketing strategy going forward. You Have the Data. Now Use It to Your Advantage. Buyer personas have been around for a long time. And while we often operate under our own assumptions of our audiences, marketers today have the tools to not only gather some hard data, but learn from their interactions, too. The problem, though, isn’t getting the data—it’s knowing how to use it to drive real, measurable results. Progressive profiling is a great place to start to better understand your current audience and who’s actually engaging with your product or service. Now it’s your job to roll up your sleeves, get to work, and adjust your marketing to deliver a great experience for each user!